We made it! After a good half day of airports and airplanes, we arrived in SF around 1PM local time. We got our luggage (yes, I packed for 3 months), and found our inn. We are staying at a neat local bed and breakfast - a first for us. Grabbed some food at a trendy local place, and headed out for some sightseeing. Although we didn't see much. 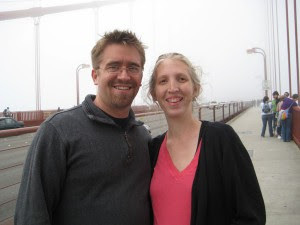 We went to the Golden Gate Bridge, and all we saw was fog! Maybe it will clear up later this week and we will get a chance to go back. We ventured out on the bridge a little ways to see some more, but heights aren't my friend, and wow is that bridge high! And I have to say, it is COLD here!! We are now preparing (mentally) for all the testing tomorrow. We have a lot of questions for the doctors. I believe God will guide us to the right place for Ruth, but the path is pretty scary right now. Tomorrow is meeting with doctors and a couple sonograms, with the fetal MRI in the afternoon. I was told that if at any point the doctors saw something that would disqualify us from the study, they would stop the tests and tell us. So, tomorrow, no news is good news! We really appreciate all the kind messages and prayers, they mean so much to us. We will update on facebook and here on the blog as we learn anything this week. NO complaining about the cold as we suffer in this heat!! :-) Continued thoughts and prayers.